Artificial intelligence (AI) is the part of computer science concerned with designing intelligent computer systems (systems that exhibit characteristics we associate with intelligence in human behavior). 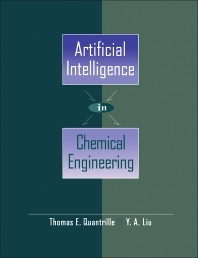 This book is the first published textbook of AI in chemical engineering, and provides broad and in-depth coverage of AI programming, AI principles, expert systems, and neural networks in chemical engineering. This book introduces the computational means and methodologies that are used to enable computers to perform intelligent engineering tasks. A key goal is to move beyond the principles of AI into its applications in chemical engineering. After reading this book, a chemical engineer will have a firm grounding in AI, know what chemical engineering applications of AI exist today, and understand the current challenges facing AI in engineering. Introduction to AI Programming: Introduction to Prolog. A More In-Depth View. Arithmetic, Lists, and Recursion. Backtracking and Program Control. Input and Output. Built-In Tools. More Built-In Tools. Programming Techniques in Prolog. Prolog and LISP. Introduction to AI Principles: Introduction to Artificial Intelligence. Prolog in Artificial Intelligence. An Illustrated Case Study: EXSEP--An Expert System for Separation Synthesis: Introduction to EXSEP. Chemical Engineering Perspective of EXSEP. User's Perspective of EXSEP. AI Perspective of EXSEP. Knowledge-Based Systems and Artificial Neural Networks in Chemical Engineering: Overview of Knowledge-Based Applications in Chemical Engineering. Introduction to Artificial Neural Networks. Appendixes: American Standard Code for Information Interchange (ASCII). EXSEP Program Listing in Turbo Prolog. Glossary of Terms. Solutions to Selected Exercises and Practice Problems. Index.